Rush Hour Rewards | Poudre Valley REA, Inc.
PVREA will pay you to use less energy when everyone else is using more. And your Nest Thermostat can do it automatically. Poudre Valley REA wants to lower demand during energy rush hours, like those hot summer afternoons when everyone’s cranking up the air conditioning. A Nest thermostat can help you use less energy by tweaking the temperatures up to three degrees during the rush hour, while still keeping you comfortable. You need to be a Poudre Valley REA member with central air conditioning or a heat pump, and working Wi-Fi to participate. Even if you already have a Nest thermostat, PVREA will give you a $50 bill credit for signing up for Rush Hour Rewards. Plus, you’ll receive an additional $30 bill credit after the cooling season if you stay enrolled. Members can purchase up to 3 thermostats per account, and will receive one Rush Hour Rewards bonus. Read the full Terms and Conditions. 1. Buy your Nest Thermostat. Order your Nest Learning Thermostat or Nest Thermostat E online through the PVREA Nest store to receive your co-op member discount. Nest will ship straight to you and your Nest purchase will appear as a charge on your next PVREA bill. View the different Nest thermostat options here. Already have a Nest thermostat? Sign up for Rush Hour Rewards now. 2. Install & Register your Nest Thermostat. Visit Nest.com for helpful installation guides and videos. 3. Sign up for Rush Hour Rewards. 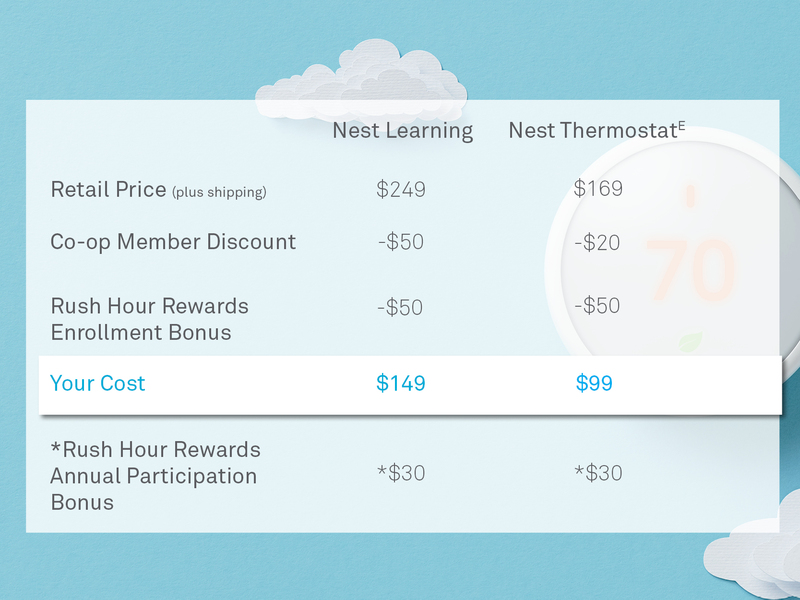 Even if you already have a Nest thermostat, enroll in Rush Hour Rewards in your Nest account to earn up to $80 in bonuses. Poudre Valley REA will give you a $50 bill credit when you sign up for Rush Hour Rewards. And if you stay enrolled through the summer, you’ll receive an additional $30 bill credit after the cooling season.